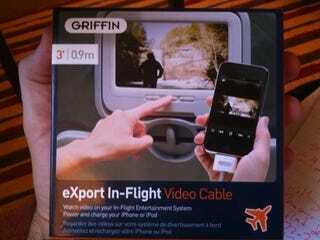 Intrepid Runway Girl Mary Kirby has got her hands on the new Griffin eXport In-Flight Video Cable, which will let you connect your iPhone or iPod to the in-flight entertainment system in your airplane seat, displaying content and data. The Griffin cable uses the Panasonic eXport port standard, which is approved by Apple under the "Works with iPhone" and "Made for iPod" programs. The eXport port technology is now available for licensing by other in-flight entertainment (IFE) systems manufacturers. The port allows the IFE system to access and display the iPhone/iPod's multimedia content. as well as navigate through the user playlists, and content-metadata like artists or genre. Right now, you can find it in United Airlines—only in first class—and Continental Airlines' new Boeing 777s.